(Bloomberg) -- A stocks sell-off that started in the U.S. on Friday extended to Indian equities after a range of economic data dimmed the outlook for global growth. Key local indexes dropped for a second straight day. The S&P BSE Sensex fell 0.9 percent to 37,808.91 at the close in Mumbai, the steepest decline in more than six weeks. The NSE Nifty 50 Index also slid 0.9 percent. Both the gauges had risen for five straight weeks through Friday. 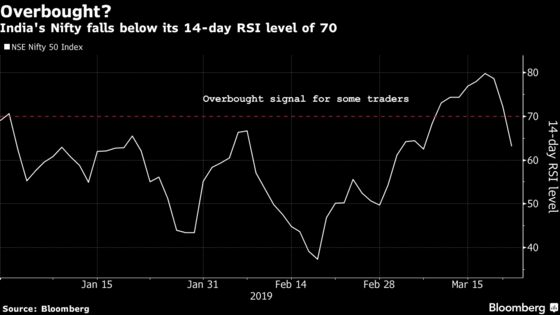 India’s equity market has been overbought for the past eight days, signaling gains might have come too quickly to hold. A surge in foreign investment inflows led to a recent rebound in local stocks, amid bets on a revival in company earnings, low interest rates and an increasing chance of another five-year term for Prime Minister Narendra Modi in a national poll scheduled through May. “It makes sense not to take any aggressive bets currently as the situation is still uncertain and it’s better not to deviate portfolios much from their benchmarks,” said Hemant Kanawala, equities head at Kotak Mahindra Life Insurance Co. in Mumbai. Sixteen of the 19 sector indexes compiled by BSE Ltd. dropped, led by a gauge of telecom stocks. Eleven of those indexes fell at least 1 percent. Twenty-four of the 31 Sensex members and 35 of the 50 Nifty stocks retreated. Both the Sensex and Nifty had held above the 14-day RSI level of 70 for eight days, a signal to some traders that they were overbought. Media firm Zee Entertainment Enterprises Ltd.’s 4.2 percent decline was the steepest among Nifty members. State-owned refiner Indian Oil Corp. gained 4.7 percent, the most in more than a month, as Brent crude futures dropped for a third day to its lowest price in nearly two weeks. Karnataka Bank Ltd. dropped 2.6 percent, the most since Feb. 15, after reporting a fraud totaling 132.6 million rupees ($1.9 million). Consumer-goods maker TTK Prestige Ltd. climbed 5.3 percent as its board will meet March 29 to consider a free-share issue. Guar gum polymer maker Vikas WSP Ltd. rose by its daily 10 percent limit after winning about 1.8 billion rupees of orders. Jet Airways India Ltd. jumped 12 percent, the most in more than two months, on reports that Chairman Naresh Goyal stepped down. The airline confirmed the departure after the market closed.